The Scholarship Disbursement For Meritorious Students under the aegis of Prerana, Infosys, Mangalore, Vidyaposhak, Dharwad, Dhrithi Foundation, Mangaluru, and Yakshagana Kalaranga, Udupi was held on Sunday, 25th September 2016 at Infosys Campus, Kottara, Mangalore. 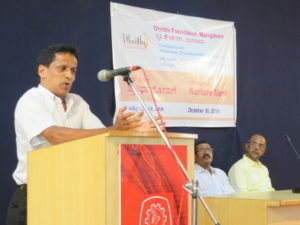 Mr. Chandra Sekhar, IGP and Commissioner of Police, Mangaluru City, was the Chief Guest on the occasion. 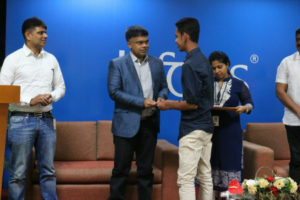 A total of 163 students, including those pursuing professional courses, from Udupi, Dakshina Kannada and Kasaragod districts were supported to the tune of Rs. 11,48,000. 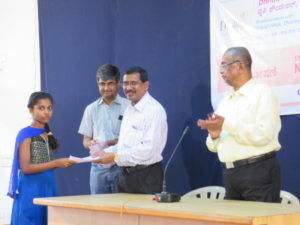 The total amount of scholarship provided to students from Dakshina Kannada by Prerana was Rs. 2,21,000, for 75 students. This is the tenth year that Prerana, in association with Dhrithi Foundation, has extending support to the needy meritorious students of Dakshina Kannada district. 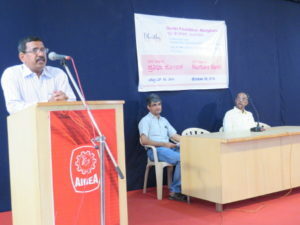 Addressing the students, the Chief Guest of the occasion, Sri Chandra Sekhar, stressed on the need for hard work and honesty in achieving success and excellence. 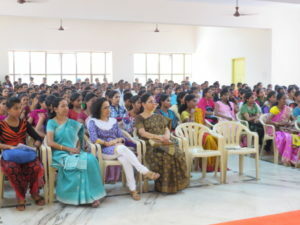 He urged the students to make the best use of all the support that has been extended to realise their dreams. 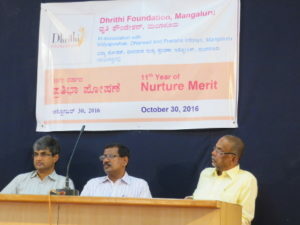 The second Scholarship Disbursement For Meritorious Students, for the remaining students of Dhrithi Foundation Nurture Merit Programme, was held on Oct 30, 2016 at Karnataka Bank Employees’ Association Auditorium Bejai-Kapikad, Mangaluru. 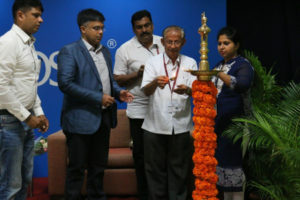 Dr. Prabhakar H, Senior Cardiologist, was the Chief Guest and Sri PR Karanth, General Secretary, Karnataka Bank Employees’ Association, was the guest of honour. Rs. 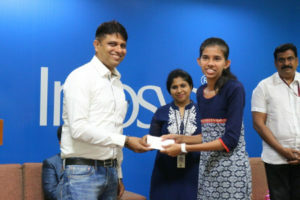 4,09,000 was disbursed to 225 students on this occasion, contributed by the donors of Dhrithi Foundation, Prerana, Infosys, Mangalore, and Vidyaposhak, Dharwad. 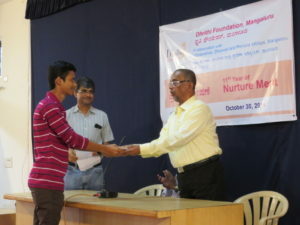 This was the eleventh year of Dhrithi Foundation’s Nurture Merit Programme and during this period, a total of Rs. 66,50,000 has been provided to 2530 students. Speaking on the occasion, Dr. Prabhakar stressed the need for education, and said that lack of education is like being a wingless bird. 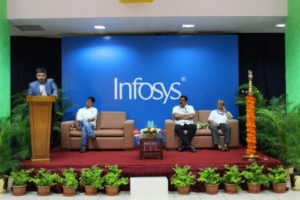 He urged the students to work with dedication and achieve greater heights. Sri PR Karanth said that he was overwhelmed by the work done by Dhrithi Foundation and assured every possible help from the KBEA. 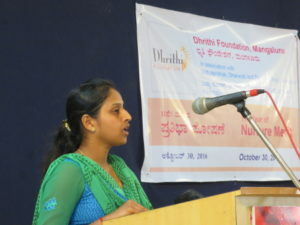 Soumya S, a Dhrithi beneficiary who has completed MSc in mathematics and is now working as lecturer at Gokarnanatheshwara College, Mangaluru, narrated her experience, and suggested that beneficiaries like her must come forward to help other students, not only monetarily, but also by imparting knowledge. 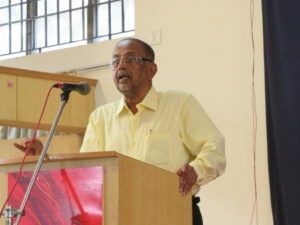 Sri Chandrashekhar, who as been working actively as a volunteer, narrated his experience and urged the students to make the best use of the support. 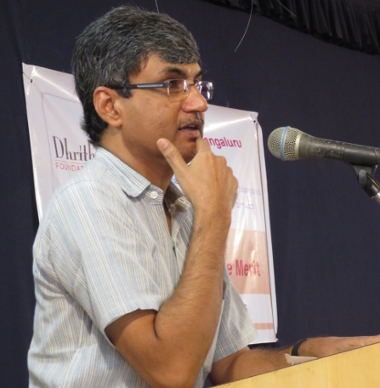 Dr Srinivas Kakkilaya, Secretary of Dhrithi Foundation, welcomed and conducted the proceedings. 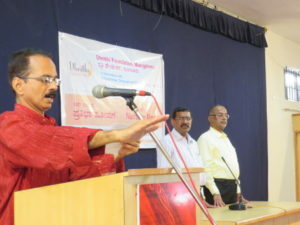 Sri Harish Pejavar, Treasurer of Dhrithi Foundation, administered the pledge to students.